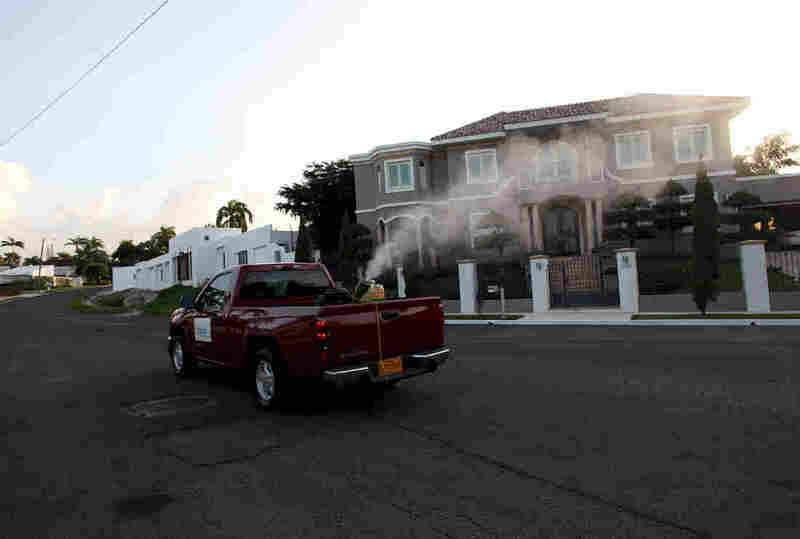 Zika Finds Its 'Goldilocks Zone' in Puerto Rico : Shots - Health News The warm, wet summer months in Puerto Rico are the perfect breeding time for the mosquitoes that carry Zika virus. As the mosquitoes multiply there, so do the human cases of infection. A health department pickup truck sprays insecticide against mosquitoes in a San Juan, Puerto Rico, neighborhood in January. The Zika virus outbreak in Puerto Rico is expanding rapidly. Recently, the island has been reporting more than a thousand new cases of Zika each week. The situation is expected to get worse before it gets better. "We are right now probably in the month or 6 weeks of peak transmission," says Tyler Sharp the lead epidemiologist for the Centers for Disease Control and Prevention's Zika operation in Puerto Rico. Previous outbreaks of dengue fever and chikungunya, which are transmitted by the same mosquito as Zika, Aedes aegypti, suggest the hot, wet summer months in Puerto Rico now are just right for Zika to flourish, Sharp says. "The more rains you get, the more mosquitoes you get. The more mosquitoes, the higher the rate of transmission," he says. "And also the mosquitoes like warmer temperatures and are able to replicate the virus more efficiently at at least slightly higher temperatures." He calls August in Puerto Rico the "Goldilocks zone" for Zika virus replication. The island has already had more than 8,000 confirmed cases of Zika. The CDC predicts that by the end of the year, 20 percent to 25 percent of the roughly 3.5 million people on the island could be infected with the virus. Many of those people would have mild symptoms or even none at all. But such a widespread outbreak means that thousands of pregnant women could be exposed and their babies might be at risk of having severe Zika-related birth defects. And the tools to fight Zika are limited. Public health officials weren't able to stop previous outbreaks of dengue and chikungunya while they were in progress, Sharp notes. Zika is even more complicated because it's transmitted by both mosquitoes and sexual activity. "So we have things that we think can be effective," he says. "We know that individuals can take approaches to reduce their risk of infection. But in terms of breaking the epidemic, or stopping transmission, there's nothing that we know about that's been scientifically evidenced to show that this will work, that this is the solution." Even the insecticides that are being used to spray homes or fog some high-risk neighborhoods have been losing their punch. Mosquitoes have been developing resistance to them. "What we've seen in Puerto Rico, as we see in many regions, is that there is a wide variety of resistance not to all insecticides but to many of them," Sharp notes. "And that [resistance] can change over time depending on what's being used in the communities, in the population." A plan for aerial spraying of an insecticide called Naled caused an uproar here. San Juan's mayor called the plan "environmental terror" and late last month the governor blocked the proposal. Naled is the same chemical that's being sprayed from planes over parts of Miami to combat Aedes aegypti mosquitoes there. Sharp says the efforts against Zika in Puerto Rico rely primarily on people. People protecting themselves from mosquito bites and people attacking mosquito breeding grounds. The only good news is that if previous outbreaks of dengue and chikungunya are any guide, the high levels of Zika transmission here should start to fall in September or October.